J.B. Hunt Transport Services Inc. profits fell 8.3% in the third quarter, the company announced Oct. 13, coming up short of the Bloomberg News consensus forecast of analysts. The Lowell, Ark., truckload carrier generated $100.4 million in profits during the three-month period ending Sept. 30, 2017, or 91 cents per share, a nickel short of projections. 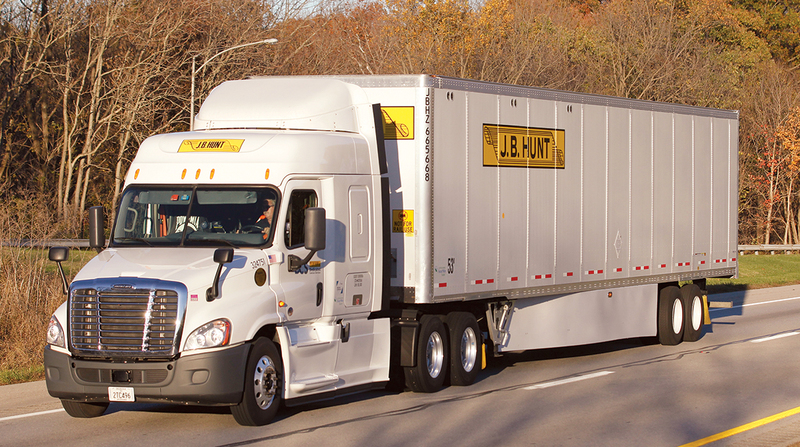 A year ago, J.B. Hunt made $109.4 million, or 97 cents per share. However, revenue rose 9% to $1.84 billion, exceeding the $1.82 billion prediction and up from $1.69 billion in 2016. J.B. Hunt Intermodal, the largest unit, generated $1.05 billion in revenue in the third quarter, up 8% from a year ago. However, operating income slid 7% to $109.1 million. Nevertheless, the number of intermodal loads drayed during the quarter rose 5.6% to 516,260. Revenue per load increased to $2,030 from $1,983 last year based on a 23-mile increase in the average length of haul. The results were similar in nature at the second-largest division, J.B. Hunt’s Dedicated Contract Services. Revenue there climbed 11% to $438 million, but operating income slipped 18% to $42.9 million. “Operating income decreased by 18% from a year ago primarily from the timing between increasing driver wages and recovery through customer contracts, increased driver recruiting costs including the length of time to fill open trucks … and approximately $1 million of excess costs associated with operations in the hurricane affected regions compared to the same period in 2016,” the company explained. Similar to intermodal, freight loads increased to 655,881, or 7.9% higher than last year. The average length of haul was unchanged, but the revenue per truck per week increased $76 year-over-year while filling about 748 more trucks on average. At J.B. Hunt Integrated Capacity Solutions, the third-party logistics and brokerage arm, revenue surged 16% to $269 million, but operating income fell 14% to $7.3 million. The total number of loads the 3PL division handled dropped 11% to 236,796, but the revenue per load went up to $1,138 from $973 in 2016. Margins remained unchanged at 12.8% because the company said it has a mixture of contractual and spot brokerage business. “Higher year-over-year technology development costs and a higher number of branches open less than two years (23 versus 15) more than offset the increased revenue compared to a year ago. Total location count grew to 44 compared to 40 at the end of third quarter last year,” the company wrote. At for-hire trucking, J.B. Hunt’s smallest division, revenue fell 5%, but operating income grew 12% to $5.7 million. Loads in the truck unit dropped to 90,520 from 97,052 in 2016 and the average length of haul decreased 16 miles to 437. Total loaded miles also fell, to 39,516 from 43,865, but high rates per loaded mile helped revenue per tractor per week rise $56 to $3,524.